Happy Valentine's Day to all!! 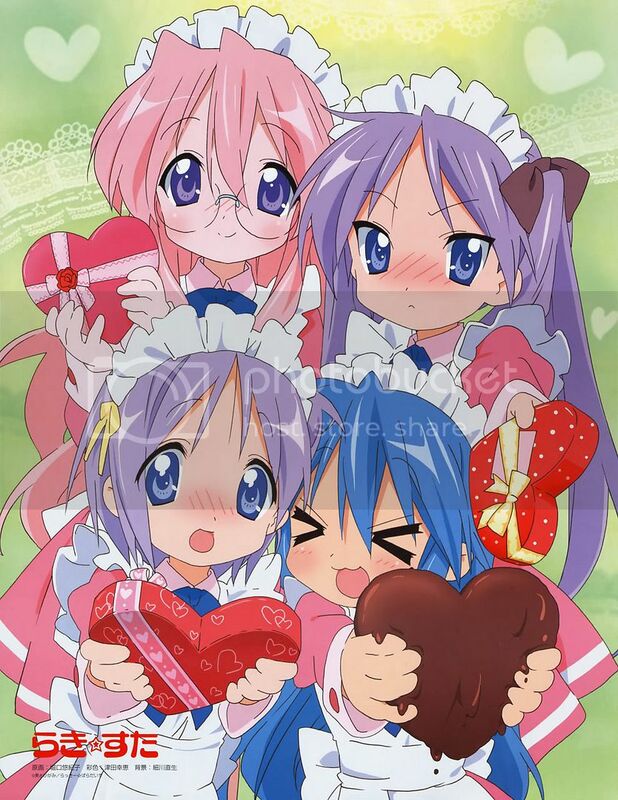 Lucky Star Style ^^. As everyone should know today is Valentine's Day, one of the days in a year where a big fat hole gets created in the guy's wallet. I definitely would prefer the Japanese version of Valentine's Day, where the girl gives chocolate to the guy, then the guy would return the favour on White Day (14 March), rather than "our" version where the guy usually foots/plans everything. Either way I'm once again going to spend this day as per any other normal day because: 1. I got to go camp and work, 2. I don't have a girlfriend ><. Hatsune Miku VS Kagamine Rin - Chocolate☆Magic. Dedicating this song and Wishing a Happy Valentine's Day to all the couples out there. And also good luck on making sure all those planning goes through smoothly for the guys, so that all the effort is not gone to waste. Signing out.